Photo 1: Flare shows as discolored areas below and to the right of the sun in this image. This image was taken during the same time as my Photon Worshippers image which won Astronomy Photographer of the Year, 2010. The unnatural appearance is a result of processing several images using high-dynamic-range (HDR) software. 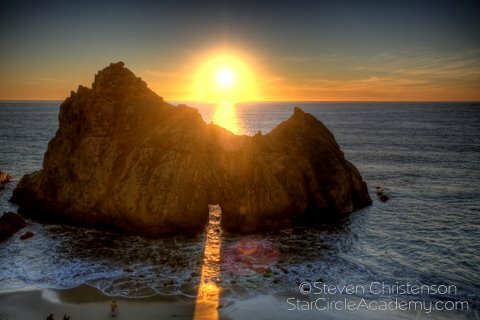 HDR processing did not eliminate the flare which detracts from the beam of light shining through the portal. A common problem facing photographers – night or otherwise – is the lens flare that may occur when a bright light source is in the frame or just off axis. 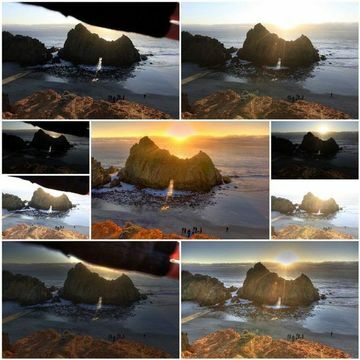 Flare is evident in several locations in Photo 1 – notably at the saddle of the rock and in the water at the bottom center of the image. Photo 1 was processed using high dynamic range techniques but those techniques did not eliminate the flare. Sometimes flare provides an enhancing effect, and sometimes not. Below are two tips you can use to remove unwanted flare from your image. These tips work best when using a tripod to capture your images. And tips that work in the daytime also work at night. Not many people realize that when flare is present, there is also often a reduction in contrast called “veiling glare”. This effect is sometimes more pronounced when using a filter. Our first recommendation is to always use a properly sized hood to block as much out-of-frame light as possible. 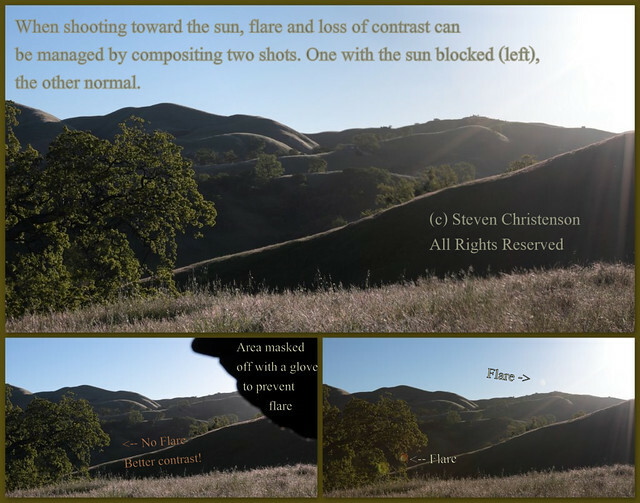 When the bright light is in the frame, or is not fixable using a hood or manual shielding a powerful technique is to combine two shots as illustrated below. The large upper shot is the result of combing the two lower shots. Obviously this technique works best when using a sturdy tripod – something we always recommend. My final, awarding winning “Photon Worshippers” image was processed using the “Hand HDR” technique described in “The Photoshop Darkroom“. It took quite a bit of effort to remove the flare from the image – because I had not yet discovered the technique described here! A similar strategy works especially well when taking long exposures at night – and it requires only one exposure. 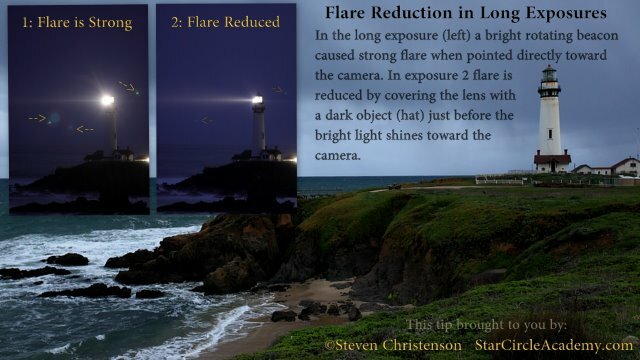 The bright rotating beacon from the lighthouse in Illustration 2 created problems for a 20 second exposure. The flare from this intermittent bright light was managed by using a hat as a shield just before the bright beam swept across the camera. This blocking strategy can also work when a car, hiker, bicyclist or other light bearing object sweeps light in the direction of your lens. Unless the palm of your hand is coated in matte black soot, you won’t want to use your hand for this purpose. Be careful not to bump your lens or tripod when blocking the light and be sure to use a dark, non-reflective object to block the light because even if you have coated your hand in soot you probably won’t want to get that dirty stuff anywhere near your camera. This entry was posted in Photo Tip, Photoshop, Review and tagged compositing, lens flare, loss of contrast, shielding, tip on March 23, 2011 by Steven Christenson. Here is an example of flare reduction in an HDR image. Note: Stopping down (larger f/number) increases flare visibility, as does the use of filters – especially dirty ones.